Athens Greece is the gateway to the Greek Islands as well as many other Mediterranean ports of call. Cruises from Athens can take you on breathtaking voyages in the Aegean Sea, The Mediterranean and the Black Sea and stop at many varied places along the way. Here are the top 10 cruises to take this year from Athens. The 8-night Variety Cruises “Jewels of the Cyclades” tour takes you from beautiful Athens on a tour of the many Greek Islands. Enjoy the azure waters, the whitewashed buildings and the lovely scenery of the region. The Princess Cruises 12-day Holy Land Cruise takes you to many Mediterranean cruise ports as it winds its way between Athens and Venice. Stops include Turkey, Greece, Israel, Jerusalem, Cairo and Croatia. Cruises from Athens aboard a sailing ship with real sails can be had from Star Clippers. 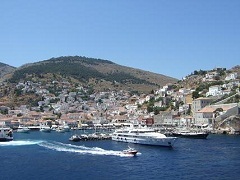 Their 7-night Eastern Mediterranean/Northern Greek Island tour visits the Islands and ports in Turkey. Greece and Turkey cruises are part of the package when you choose Windstar Cruise lines. Their 7 day offering features the best of both amazing countries as you sail the Mediterranean Sea. The Voyages to Antiquity line offers Athens to Istanbul where you explore the many Greek Islands en route. See the Ruins of Troy and many other historical places when you choose this cruise that includes 2 nights in Athens pre-cruise and 2 nights in Istanbul post-cruise. Variety Cruises has an 8 night Aegean Odyssey cruise that goes to many of the famous Greek Islands. See why this area is a sought after destination for many tourists as you island hop with this tour. Princess Cruise Lines offer a cruise from Athens to Venice that is a 24 day excursion into the Black Sea and the Mediterranean. Explore the Ukraine, Romania, Croatia, Italy and Greece in this once-in-a-lifetime adventure. Voyages to Antiquity has an 18 day cruise called “Time Fears the Pyramids” which cruises from Athens to Cairo. See the classical sights of Greece, the Holy Land and Ancient Egypt’s secrets on this informative and educational trek. Cunard Lines’ the Queen Elizabeth takes you on a 12-night Holy Land excursion on a roundtrip from Athens. Sail the Greek Islands, Turkey and Ashdod, to name only a few. The Princess Lines 14 day Mediterranean/Greek Islands cruise shows the jewels of the Islands, Italy, Monte Carlo, Barcelona and more. Cruises from Athens take you on many breathtaking journeys. The Greek Islands are a must to see, and with Santorini cruises you can do just that on one of the most popular of the islands. Take the adventure you have always wanted when you choose Athens as your departure port on a cruise to the beauty that is this part of the world.